Rhocky Rhoad shows off his amazing trot. Photo courtesy Cherie Lonas Mamula. 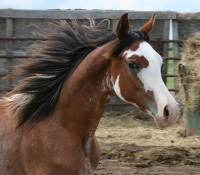 Like many owners of Khemo-related offspring, Cherie feels a connection beyond the usual horse-owner bond. "He admires my infant daughter and respects me and my space as I carry our soon to be born son. I can take my Arabian stallion and direct him with no halter, as he eagerly awaits my direction. There is a sense of partnership that I believe comes from the Khemosabi lines. 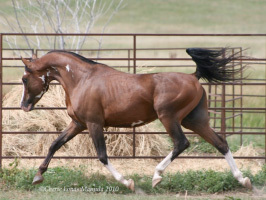 This amazing trainability and respect has been seen by many in my area (in an area where Arabians are little known) from the show arena to the vet clinic, where one particular vet bent down (to get a better view) and declared, 'He is a stallion!'" This family-friendly temperament enabled Cherie to start him under saddle on her own. She has also been able to show him herself. 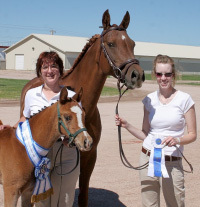 At his first USDF Breeder's Championship Open Show, Cherie showed Rhocky to a blue ribbon. Tirhamisu takes high score jonors with 82.4%. At that same show, she took his two month old daughter, Tirhamisu, into the ring and proved her sire's blue ribbon win was no fluke. Recalls Cherie, "Tirha entered the triangle and left such an impression upon the judge that he could not compliment her enough. At the end of the day she scored an incredible 82.4% and took home the highest score at the entire event, even over imported horses!" Rhevelation at his Swiss inspection. Rhocky's lavishly-marked first purebred son, Rhevelation, took it another step further. In addition to snapping up weanling wins, he was exported and took Switzerland captive. 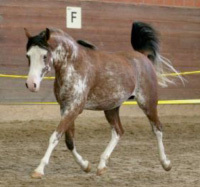 Cherie enthuses, "He has received his Swiss approval and is expecting his first offspring this year, on the heels of an incredible scoring at the stallion events where he scored perfectly on general impression and development, go, and trot thrust, and averaged an 8.33 out of 10 possible (an incredible testimony!)." On the Rhocks breezes by. Although a young stallion, his first foals are getting old enough to start careers under saddle soon. Their owners complement them for their ease of trainability and eagerness to please. Finally, Cherie explains why after owning a Khemo Arabian, nothing else will do. "The main thing I love about having a Khemo grandson, is that Rhocky Rhoad has shown me that an Arabian horse is not just a horse, but a horse that is a partner, a friend, and has that 'extra something' that draws you in. 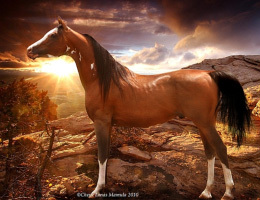 If you are not an Arabian horse lover, then you have not been around a Khemo Kid!"